I have been using Linux for over a decade now I have often been hesitant to spread the good news of Linux to my friends and family, especially those that are a bit more remote or I don’t have contact with as often. Lately, I have been inspired recently by some of the folks at Jupiter Broadcasting to encourage people to switch to Linux but have still been hesitant because of the whole tech support thing. You have to ask the questions to see if Linux will work for someone. There are many cases where it is not a good fit and I don’t bother attempting the switch. One of my issues in switching someone has been the unfamiliarity most people have with interface and the software tools. It is often not convenient or downright impossible to troubleshoot over the phone. The process of walking them through an issue when they have also inadvertently “customized” the desktop and panels makes it that much more frustrating. This all prompted me to search for a Remote Desktop application that I could reliably count on that was reasonably stable with which to remotely assist those that I have switched to openSUSE Linux. After dabbling with a few, I have come to find TeamViewer fits the bill. TeamViewer allows you to remotely access another machine, interacting with it as though you were right in front of it. Even over poor internet connections it is still very responsive, not terribly laggy and is a surprisingly real good experience. I had previously used other Remote Desktop applications that were often clunky to set up and slow over the network. My go-to remote administration has been Secure Shell logins and doing everything through the terminal. This works fine for my own systems that I know how to effectively hop through my router and into the desired system. This solution would absolutely not work for a friend or relative that is on another network of which I have no idea how it is configured. I had read several different experiences from people about TeamViewer, some positive, some not. A spectacular positive is that it is multi-platform. Though I have only used and tested it on Linux, Android and ChromeOS devices, it works on Windows, Mac, iOS, and BlackBerry. My experience has been completely positive and I must say a delight to work with. The negative that I hear from some is that this is a proprietary piece of software and the Linux version is the Windows version with a Wine wrapper around it to make it work under Linux. Regardless, it works extremely well and I have no complaints about that at all. As much as I like dinking around with computers there are times when I just need for a piece of software to setup and work reliably. TeamViewer, on their download page has an RPM installer for SUSE, which works smashingly for openSUSE. It installed without any hiccup or error message whatsoever. I didn’t have any issue with the menu item not showing up or failure to start or anything quirky at all. It really works and it really works really, really well! Once installed it started up nicely with a welcome dialog and has an interface that is clean, user friendly and efficient. Everything is very straightforward and easy to comprehend. You can dig into the documentation of features but I found that to be almost unnecessary. You do have to register for the service and associate the computers you want to your account. Sure, some may give some heartburn to those that don’t like relying on other organization’s services but for me and my use case, this is fine. This will allow you to access your computers from your computers. It is super handy, no remembering serial numbers and passwords to access them.The dialog that allows you to quick access to your Computers & Contacts you have to set up. Once you associate a computer, it uses the hostname of the computer automatically. You can change the names of computers if need be and create groups of computers. You can link all your computers to this and administer them remotely at anytime. If you have been spreading the good news of [openSUSE] Linux to your friends and family to those that are less technically competent, you can install TeamViewer and segregate them in their own group or groups. An incredibly useful tool of TeamViewer is the ability to perform file transfers between the local and remote machine. If all the machines are on the same network, I would just do a file transfer over secure shell but computers that are in another location, this works splendidly. The ability to transfer some files is super, super useful. There are dozens of use cases for this.There are numerous, numerous other features you can utilize like screen capture, session recording, chat sessions, screen sharing for meetings, etc. Those are nice additional features that I am not covering here, as that was not my problem I was attempting to solve but may come back to them eventually. 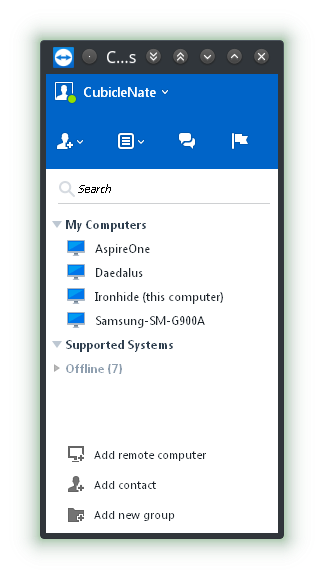 A new use that I have for TeamViewer is the ability to use my very underpowered netbook to access my more capable machine remotely to use some particular program. This gives me a lot more flexibility as to what I am toting around with me to do work. I now have the freedom, once again to use this old piece of hardware and work much more efficiently with it at no additional costs to me. I have also found that although my primary machine is a fairly compact laptop, it has somehow become larger over the years and I now have a netbook and Chromebook that are far less obtrusive to lug around. I also find that I often don’t need as much computing power as I once did. Now that I can access a remote machine, I can have that machine with the computing power do the work that needs to be done and I can just view the result on my little window into it. I am not fan of using my phone for any kind of typing or messaging… or really even looking at it. I know this is not the general trend but when I’m at my desk. I plug in my phone and set it aside only to use it when I have to answer a phone call and sometimes SMS (text) messaging. I do use a web service to write text messages but it is often lags by minutes. KDE Connect will sometimes allow me to respond to a text message but that feature isn’t working 100% yet. I have experimented with using TeamViewer to “text,” control my podcast interface and just for fun, control my FireTV using the app on the phone while sitting on a couch with my netbook perched on my lap. Not efficient, I know but was just fun to do. To be able to view the phone on my computer is a great plus. When you do log into the phone, there is a great status dashboard of the phone that I wish existed as an application on the phone itself. It gives you all the basic technical information of the phone like CPU status, RAM usage, Battery status, Device Storage, IMEI, Network information, etc. You can transfer files, uninstall apps and manage saved WiFi networks. I think Android could take some queues from TeamViewer on parsing system information of your mobile device. What I do wish I could do with TeamViewer was to be able to “turn off” and lock the screen on the Android device. Unless it completely escapes me I can’t seem to be able to do that. When logged into the phone, the screen stays on and doesn’t auto-lock. That could just be an issue with my Samsung Galaxy phone but having the ability to lock the phone would be great additional feature. Not so much an issue with the software, but I wish that the company had another way to contribute to the project. I don’t use TeamViewer for business purposes but I feel as though I owe the company something for giving me such a wonderful product to use. Even though this is a closed source project that is proprietary, they fully support Linux, it works great and I can use it for free for personal use. My only concern is that because it is a closed source project that uses a service you have no control over. This free TeamViewer program may end up being taken away and I will have to give a *sad face* and will have to find another Remote Desktop Solution. TeamViewer is a nicely polished application that allows you to access your machines for either specific purposes or remote tech support for family and friends that may need a little help from time to time. Initially, my primary reason was for remote tech support but I find that I use it more often to leave my primary laptop at home and use a smaller, lighter, very minimal machine remotely and access my main machine remotely.Some people have issue with the fact that TeamViewer for Linux is a Windows program wrapped in Wine instead of a built for Linux application. Personally, I have no problem with this at all, in this regard, the ends justifies the means. Would I prefer that it were written in Qt so that it matches my KDE Plasma Desktop but in the end, as long as the program works well and works reliably, I really don’t care what it’s written in. Thankfully, for now, TeamViewer is free and I am truly grateful for it. I appreciate the generosity of the company to provide it for me to use and especially to use on openSUSE Linux. If you are a purist for open source software, this is probably not for you. I will continue to use TeamViewer for the foreseeable future. 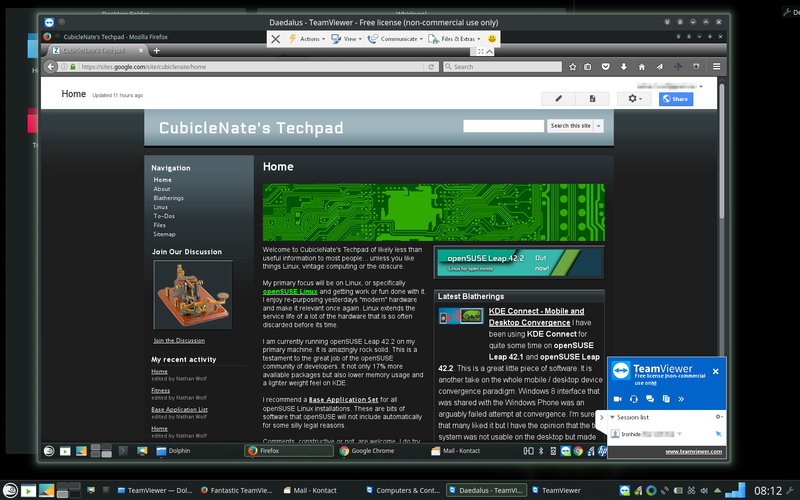 I highly recommend trying TeamViewer to anyone that has a need for remote desktop control. If you just want to dabble in remote administration, this is a quick and easy way to try it out. The creators of this software have done a phenomenal job and I truly appreciate all of their efforts and support of Linux.